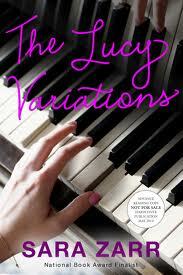 Award-winning Sara Zarr does it again with her latest contemporary YA novel, THE LUCY VARIATIONS. I like this book. Big surprise there. The biggest reason I always like Sara's work, besides that I like Sara, is her characterization. She makes her characters so human it's scary. Sort of like cloning. I half-expect these people to walk off the page. In the words of one reviewer who didn't love the book as much as I did, "I started out disliking almost everyone, and then about halfway through found myself to be completely, irrevocably, emotionally invested in all of their lives, good or bad." He is an emotionally abusive monster. . . . I’m going to go ahead and slap him with Narcissistic Personality Disorder and a sprinkling of generic sociopathic tendencies. I spent the entire book wanting to set fire to him. Here is my description of the same character: Well intentioned. Stubborn. Stifled. Flawed. Afraid. Tragic in his inability to experience real joy. Have you read LUCY yet? What did you think of Grandpa Beck? Can you think of any other literary antagonists who are strong enough to be intimidating but weak enough to stir a little human empathy? I'm going to ask you about this when I see you. Remind me if I don't.